Porsche Tracker - We have a range of tracker all suitable for installation to the whole Porsche model range. All our Porsche Tracker below are both insurance and Thatcham Approved. Most insurers are happy with a Category 6 tracker on Porsche models however some do require a Category 5 device, for your convenience these are all shown below. 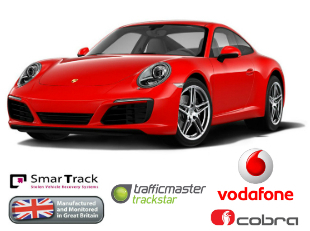 We offer trackers for your Porsche from the leading vehicle security manufacturers including Smartrack, Vodafone Automotive (formerly Cobra) and Trackstar. Often vehicle manufacturers will have their "recommended and preferred" brand of tracker that they like to see installed to their vehicles. Porsche favour the Vodafone Automotive (formerly Cobra) brand, which is stocked by us and shown below. We often advise this preferred brand for Porsche vehicles still within the manufacturers warranty, as this runs no risk of compromising any electrical warranties in place. Of course if your vehicle no longer has the balance of a warranty in place or, even if it has and you would like to choose a different brand of tracker then we would be happy to carry out the installation at your home or place of work. Please browse the below tracking systems for more details. You can make a booking for installation easily by clicking on the enquire tab of your chosen product. We are also available via email on sales@sasmobile.co.uk or telephone 0113 3979597 where we will do our very best to help you.